Hyperion rover gets its first run in the Utah desert. And just as NASA has, these students have overcome a variety of challenges in reaching their destination. Money, time and mechanical problems have presented obstacles — giving these future space engineers a big dose of reality. Unlike the other teams that consist mostly of engineering and physics majors, SKNL members are aviation students who have built model planes and drones for national and international contests. The team is one of three that have made the trip from Poland. "We didn't expect that the project would cost so much," Laszczak said. Each team had a budget of $15,000 for their rover — a sum that they had to raise themselves, along with money for travel. For other teams, the biggest challenge was time. 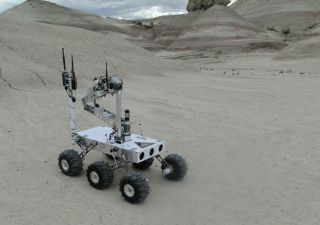 The team from the Bialystok Technical University in Poland said it raised the money for the project with just a month before its finished rover Hyperion was due to be flown to the United States. They made it but said they'll be conducting most of their tests on-site in Utah. Their enthusiasm remains high. "We have building robots in our blood," said Piotr Ciura, Hyperion's coordinator. The teams have been inspired by Mars rover Curiosity, as well as by winners from past University Rover Challenges. With two previous competitions under its belt, the team from the Wrocław University of Technology in Poland has come up with several innovative features for its new rover — dubbed “Scorpio” — including a new wheel configuration. "The front and the rear ones are light and rigid constructions, while the middle ones are made of abrasion- and tear-resistant fabric filled with granulated polystyrene," said Konrad Cop, a member of team Scorpio. The new wheels provide an optimal balance of traction, lighter weight and shock absorption to navigate the terrain challenge across the rocky desert, he said. The Helios team from Cornell University built a rocker-suspension design, inspired by NASA's Rocker-Bogie system found in its Mars rovers. "We used a combined suspension system of rockers in the front of the rover and an independent spring suspension in the back," Jane Kim of the Helios team said. Their adaptation of the NASA system allows Helios' four wheels to stay in contact with the ground, while significantly reducing the weight of the suspension system, she said. Vehicles may not exceed 50 kilograms. Inspiration also comes from imagination. "We also try to get ideas for how to build a robot by asking the question, ‘What is every single possible solution to the given problem?’, and then we eliminate or combine ideas until we think we have the best solution," said Chris Howard, leader of the robotics team from the University of Washington. But things don't always go as planned. Despite adequate funding and a realistic project schedule, the team from the University of Washington ran into a bit of trouble when building their rover, called "Frozen Icarus." They hit a low point when they learned the water-jet company contracted to make parts for their robot's arm would deliver the parts four weeks later than expected, leaving just a week for testing before the competition. Then, the 3-D printed motor mounts for the drive wheels suddenly collapsed — just two weeks before the competition, Howard said. Yet Howard still refers to the rover as "my baby." And his baby has an arm with the capability to "go infinitely through itself" — an intriguing feature that will be revealed once the competition gets underway. All teams have their eyes on the prizes, which include cash, an opportunity to present at the annual International Mars Society Convention in Colorado this summer, and a year’s worth of bragging rights. Follow Leslie Meredith @lesliemeredith. Follow us @TechNewsDaily, on Facebook or on Google+.